Coming Soon…The Stupidity of Standardized Testing & The Cruciality of Creative Learning! | Georgia Teachers Speak Out! ← The Soulless, Soviet Atlanta Public Schools And Its Culture Of Lies, Cheating, Fear, Intimidation, & Retaliation; Beverly Hall’s Standards Were So Low That Snakes Had To Slide Over Them; Surely Ain’t Committed to Standards (SACS); Mark Elgart Is Missing-In-Action; MACE Had The Prophetic Voice The Entire Time; Parks Middle School Is The USA’s Poster School For Cheating; & Mayor Kasim Reed Will Be Eating Home-raised Crow Instead Of Dining At The Piedmont Driving Club! Coming Soon…The Stupidity of Standardized Testing & The Cruciality of Creative Learning! Y’all give me a few [hours, minutes, days…but not weeks or months or years! ], and, Lord willing, I’ll kick you out a good article (heck, do I write anything but good articles? Ha!) about how stupid the standardize testing mania is. I have been railing against this false god of standardized testing orally and in writing for over 30 years. That’s right! I have been on its case like stink on sh-t from the Jump Street. I may be a “Johnny,” but I am not a “Johnny-come-lately.” The famous (or, “infamous”) Vince Lombardi had a very well-known saying: “Fatigue makes cowards of us all.” Well, standardized testing makes imbeciles of all educators. It has educators (and, “educrats” in particular) acting like locked-in trunk monkeys…jumping from seat to seat and window to window. All this No Child Left Behind (NCLB), Race To The Top (RTTT), Quality Basic Education (QBE), Iowa Test of Basic Skills (ITBS), and Criterion-referenced Competency Test (CRCT), etc., ain’t worth aa S-H-I-T when it comes to preparing our young people to cope, overcome, and prevail in the real world. The theme of American Public Education (APE)…Monkey Feet To The Future! 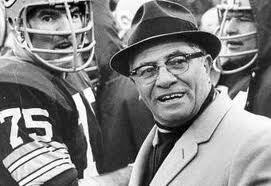 Coach Vince Lombardi would be considered too “crazy” to be allowed to teach and coach in American Public Education (APE) today. Just think of the genius that our kids would miss out on! Wow. The standardized testing of children and the standardized curricula and standardized pedagogy are monkey-stupid. Chimps can be trained to jump through hoops. Our teachers and our children are not Chimps; they are humans, and American Public Education (APE) is ignoring, stifling, and brutalizing any of their creative talents and capabilities. We need to take the monkey business out of American Public Education (APE). The cheating scandals in Houston, Texas under Rod Paige, in Atlanta, Georgia under Beverly Hall, and, it looks like in Washington, D. C. also under Michelle Rhee are just the tips of many educational icebergs! And to think that Paige, Hall, and Rhee have used this monkey-business to promote their careers on some “Super Star” level is enough to make you want to chew tobacco! Oh, by the way, the standardized, industrial type schooling process used to bore the crap out of me. But, my father was a school principal, and I didn’t have much choice but to stay on the straight-and-narrow. But, just think about the poor children who don’t even have a father around. We need to free up our educators so that they can be creatively empathic with our children! In this type of environment, all children can and will thrive! 3 Responses to Coming Soon…The Stupidity of Standardized Testing & The Cruciality of Creative Learning! John — I am a ‘product’ of the DeKalb public school system of the 60s and 70s, which — if I am to believe what I was told — was considered one of the nation’s best at that time. I wasn’t a particularly good student (expelled during my junior year of high school), but I was not disruptive to the other students. That would have been an unpardonable sin in the eyes of my parents, who first and foremost taught their children respect for the rights of others. At any rate, I was under the impression that the test scores were used — in large part, at least — for ‘placement’ of students into classes made up of those with similar test scores. In other words, those who performed highest on the tests were grouped together the next school year into ‘the smart class’. Those who scored worst were put together in ‘the dumb class’ (as we jokingly called it), and everyone else made up the third class (for which we had no witty name). I didn’t fully appreciate it at the time, but classroom instruction for those of us in ‘the smart class’ was not often disrupted due to unruly behavior. I don’t know what kind of experience was had by those in the other classes, but for the higher performing students this system appeared to work pretty well. Our teachers were energetic and highly-motivated, and most of us kept up with the pace of learning without much difficulty. Does this system of ‘placement’ based upon standardized test scores still take place? If not, perhaps it deserves reconsideration. Seems like the least we could do for the genuinely high achievers (and those with that potential) within our school systems. It has been said that ‘the poor will always be among us’ and that so far has held true. The same can surely be said about ‘poor students’ regardless of our efforts to the contrary. It’s commendable to have high expectations for everyone, but we must be pragmatic and accept the fact that many of these students will never be high (or even middling) achievers and be prepared for whatever consequences that has. I don’t suppose anyone is willing to state that publicly, but isn’t it unfair to saddle our teachers with unreasonable expectations? Butler9: You raise some serious and interesting points. I too remember the grouping that took place within the class itself when I was in elementary school, viz., Blue Birds, Red Birds, and Yellow Birds. “Differentiated Instruction” is just an attempt to try to reach the students with lesser abilities who have been thrown into the mix with the more gifted students. Then, on top of this, we have the new collaborative trend which began a few years ago. Now, it is mandated everywhere, from what I understand. Some of these kids with some handicaps are simply lost in the regular classrooms, and no one is being fooled because the Special Education teachers follow them into these Regular Education classes. I think in the special classes like Physical Education, Art, Music, etc., perhaps mainstreaming is appropriate, but how appropriate is it in Math and English or Chemistry where requisite skills are needed (not saying that this is not so in Music and Art too) in order to understand what follows. I hate to see a kid in a class who is lost as a goose. Since you mentioned Art and Music, John, let me add that I find it incredibly short-sighted that those studies receive such short shrift in our schools today. I suppose that Art and Music are viewed as being non-essential when scarce resources are available, but what these studies should do for the majority of our students is to give them practice in ‘flexing’ their creativity. In the business world today we hear much ado about ‘thinking outside of the box’, but that is merely a fashionable term for ‘thinking creatively’. That skill is vitally important to the success of both the individual and our nation. Because of their very nature, Art and Music invite creativity. Compared to other subjects, it is relatively easy to be creative when ‘doing’ Art or Music. Therefore these subjects lend themselves to being — to use a skiing analogy — the ‘bunny hills’ of creative expression. Once students master the fundamentals of creativity on the bunny hills of Art and Music, they are then able to apply their practice of creative thinking on the ‘downhill slopes’ of Math and Chemistry and Social Studies, etc. I find it astonishing that our educational leaders don’t seem to recognize this very important concept. But I suppose that has nothing to do with MACE’s mission. Mostly just wanted to let you know that someone was interested enough to follow the links you have posted on the AJC’s ‘Getting Schooled’ blog and that I wish the best for you and your organization. I have little doubt that the vast majority of Georgia’s teachers conduct themselves honorably and carry out their duties faithfully (i.e., aligned as much as possible with their students’ interests). Like everyone, I suppose, I had great teachers and not-so-great teachers. But from nearly every one of them I was able to carry away some little nugget of advice or knowledge or experience that has remained with me for a lifetime. I only regret that most of those teachers have faded into oblivion, and I have no way of thanking them for those things.